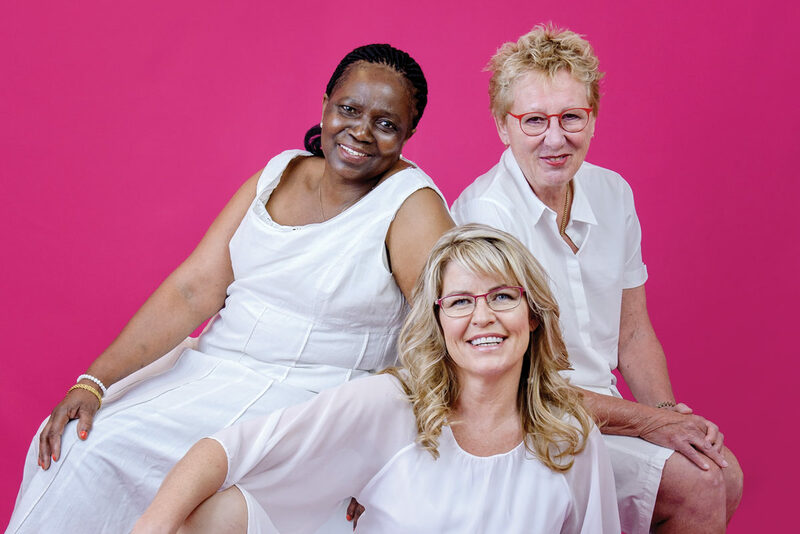 We speak to three Super Survivors, Louise Honnet, Dale Barratt and Grace Mabata, about their experience on tamoxifen. Louise Honnet (66) lives in Parkview, Gauteng with her husband. They have two children and three grandchildren. Before Louise got breast cancer in March 2016, she considered herself a large woman; she had DD-size breasts. Due to the tumour being small, a lumpectomy was done, and her surgeon explained if he takes out from the one, he must take out from the other. With this news, Louise expressed her desire to opt for B-size breasts. She then had radiation for six weeks and was put on “a seven-year sentence of tamoxifen.” She was appalled when her doctor told her she would more than likely gain weight once on tamoxifen, as she was big already. By January 2017 – four months on tamoxifen – Louise had gained nearly 2kg. “It wasn’t a horrific amount but still made me despondent,” Louise explains. However, the 66-year-old doesn’t believe the weight gain is from tamoxifen. “I think it is all in the mind. I was very down, especially from the radiation. It was almost worse than the surgery. I had to give up my life for six weeks to fit in the daily appointments that were always at a different time, and because I like being in control, this was traumatic for me as I couldn’t plan my life and then the machine would often break. Then everyone is telling you, ‘You’re going to put on weight’…and so I ate more. It is as simple as that,” Louise says. She does, however, suffer from hot flushes. She then consulted with a dietitian at Wits University Donald Gordon Medical Centre and was informed she absolutely can’t go on hormone diet due to her being on tamoxifen. She was then put on a normal, balanced eating plan that has the result of losing ½ kg a week. The eating plan allows (per day): 2 portions (small) of protein; 3 portions of fruits; 5 portions of vegetables; 3 portions of dairy; 2 portions of fats; and 2 portions of carbohydrates. “I realised I had been eating more meat than I should have,” adds Louise. Since being on the eating plan (10 months), Louise has lost 9kg. Though, her goal is to lose another 4kg. Much to her irritation, her husband who also adopted the eating plan, has lost more weight than her. The couple will stay on this eating plan, saying it is a lifestyle change. To motivate herself, Louise has kept a food diary, ticking off her portions daily. She finds this helps her not to go over her portions. Round about the time Louise changed her eating habits, her friend and herself started The Westcliff stairs – going up and then down and running back home, Monday to Friday. On Saturdays, she does a long run, and she has since taken up tennis again. “I was active before breast cancer, but it wasn’t quite as intense as those stairs,” Louise says. Since losing the 9kg, Louise has gone down two sizes and has had to buy a new wardrobe of clothes. “I love my post-cancer body; it is much better than the one before. 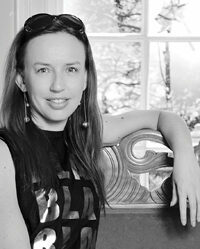 It is so liberating, especially having smaller breasts, to be able to move my arms around freely,” Louise explains. From being on three blood pressure tablets, she now only takes one. “The physical effects of not being so big are absolutely fantastic,” she adds. Louise plans to buy another wardrobe of clothes when she attains her goal weight. Dale Barratt (46) lives in Strubensvalley, Gauteng with her 10-year-old twin sons. 7 February 2016 was meant to be a joyous occasion as Dale celebrated her 45th birthday. Unfortunately, this was the day that she was told she had Grade 2 invasive mammary carcinoma breast cancer. This came as a surprise as the result of her mammogram and sonar, which were done in August the previous year, was clear. Dale has since been told that sonar results are operator dependent. The mother was reluctant to tell her sons that she had breast cancer as they had recently experienced the loss of a school mom to pancreatic cancer. 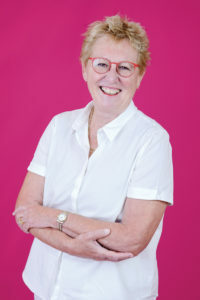 Following advice from her surgeon, her boys were brought into the consulting room and were told about their mother’s ‘lazy, slow-growing cancer’. “That night we went out for dinner and celebrated my lazy lump and that we have someone even lazier in the family,” Dale jokes. Dale had a lumpectomy and immediate reconstruction, which was followed by 30 sessions of radiation. Running her own business, she found the biggest negative effect was in her work, with her being distracted and having to take time off. On the day she started taking tamoxifen, she signed up with a personal trainer for twice a week, completing her first session that day. Then to add insult to injury, a friend, who also had breast cancer, phoned Dale the next day in a complete state, complaining about how dreadful she felt after six months on tamoxifen. “I immediately messaged my trainer, asking if I could train again that day,” Dale laughs. After nearly four months on tamoxifen, Dale hasn’t gained weight; to which she is relieved. “If I feel fat, I feel grumpy, and I don’t want to be grumpy,” she adds. She continues to train in the mornings with her trainer, though her eating habits have stayed the same as she generally eats healthy as she has always been conscious of what she eats, and she believes the saying ‘Little pickers wear big nickers.’ “I know it is still early days so I will have to see further down the line,” Dale says. It was suggested that Dale also has Zoladex (hormone therapy) injections, which would stop her menstruation. She didn’t want this and asked her doctor to discuss it in a multi-disciplinary meeting. Plus, the Oncotype DX test result also favoured her not having the injection. So, in the end, all the doctors agreed she didn’t have to have Zoladex injections. Today Dale feels that her breast cancer was yesterday’s problem, and has seen it change her approach to life. Last year, she was going to buy a luxury car, similar to the one she had, but instead she bought a cheaper one and travelled to Disneyland in America with her family. “There is an urgency to do things now, I used to get my hair blow-dried twice a week and have nice nails but I have stopped that. I would rather be doing something fun, travel and make memories,” Dale concludes. Dale’s hair and make-up done by N.Spa, Little Falls, 011 675 3110. 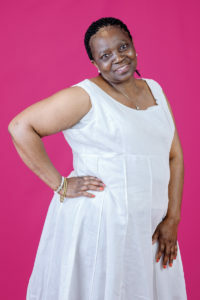 Grace Mabata (57), a widow, lives in Palm Ridge, Gauteng with her daughter and grandson. While most women dread gaining weight, Grace is on the other end of the spectrum. She wants to gain weight to get back to what she looked like before she was diagnosed with breast cancer in February 2015. “If you are sick, people can see it in your face and if you are losing weight…and with our people, if you are losing weight, people think you have HIV. So, I want to put on weight so people can see I am healthy again,” Grace explains. Grace felt a lump in her right breast but given that there are always children playing at her house, she attributed it to a child hitting her breast while she piggybacked them. Nonetheless, she went to a clinic and underwent all the tests. Once it was confirmed she had breast cancer, she had a mastectomy at Chris Hani Baragwanath Hospital in August, where several lymph nodes were also removed as cancer was found in them. To this day, movement of her right arm is limited due to this. Eight months of chemotherapy followed at Charlotte Maxeke Johannesburg Academic Hospital. She was then put on tamoxifen for five years and underwent six weeks of radiation. Not only did Grace lose 10kg due to the chemotherapy but she also suffers with terrible joint pain. “I can’t even kneel down on my knees anymore,” Grace says. 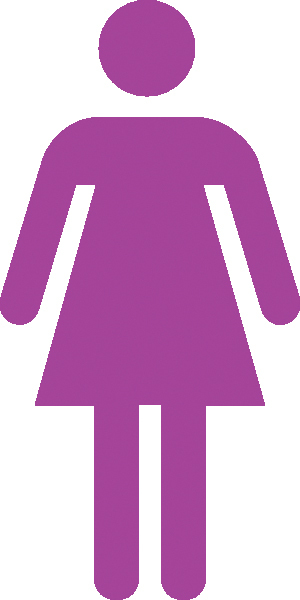 Added to that, she suffers from hot flushes caused from the tamoxifen. “I sweat so much that I have to change my T-shirt a few times a day. It is like someone threw water on me,” Grace explains. Grace went back to the clinic where she was diagnosed and asked if she could help educate patients by talking to them. Unfortunately, she was told that is the nurses’ job and she will have to find her own patients to talk to. She has been put in contact with the Breast Health Foundation. Grace is happy now that she is putting on weight and getting back to her normal body weight. “Now when I tell people I am sick, they don’t believe me because of how well I look,” she says. She currently uses a ‘fluffy’ as a prosthesis and is happy, comfortable and confident in her body. “I am fighting for my life and I’m not going anywhere. Cancer won’t win – I will beat it. I know I am going to die but not now,” Grace says confidently.